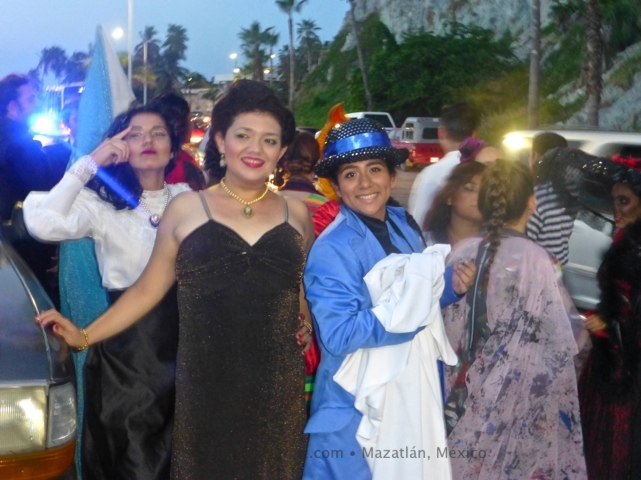 Pasacalles, Clausura del Festival Escena Mazatlán 2013 | ¡VidaMaz! The theater festival this year was wonderful, as usual. We are so blessed with terrific arts in this small city! What really capped it off for me was the “pasacalles,” an ambulatory “theater in the streets.” It was Sunday October 13 at 7:00 pm. starting at the Glorieta Sanchez Taboada and winding its way around to the Machado. 35 students from the Municipal School of the Arts theater workshop participated, along with two terrific singers—Flor Estrada and Jorge Echeagaray, plus a few wonderful dancers. It was directed by Jorge Gorostiza Zatarain. What a fun event! There was live singing and dancing (“Perfume de gardenia”, “Personalidad”, “Luna lunera” e “Historia de amor” “La Tombola”), dramatic acting, and a really cool “theater-on-feet”—the students held a sheet as they danced, and a projector showed clips of the Golden Age of Mexican cinema onto the white sheet. How creative is that? Help me with this one. El Negrito? El Músico? Lotería, of course, in this most Mexican of fiestas! Once we entered the Plazuela, Lotería was called, and the “board”—in the center of the street—was filled in with live people. It was great! Once that was complete, four luchadores put on an exciting show. The fight saw “El Santo” and “Blue Demond” against “El hombre lobo” and “Los vampiros.” You can view my 1-1/2 minute video of the event below. ← Get Your “Chicken Breakfast” Tickets Now! It really was cool. Glad you enjoyed it!